If you have read this blog for more than 5 minutes, you already know that I am sorta a sucker for painting and stenciling projects. Furniture, rooms, fabrics, crafts.. If it isn't nailed to floor or has a pulse, chances are I want to paint it. So I was so excited when the All Things Creative Team decided that this month we would feature 125 (more like 135!) 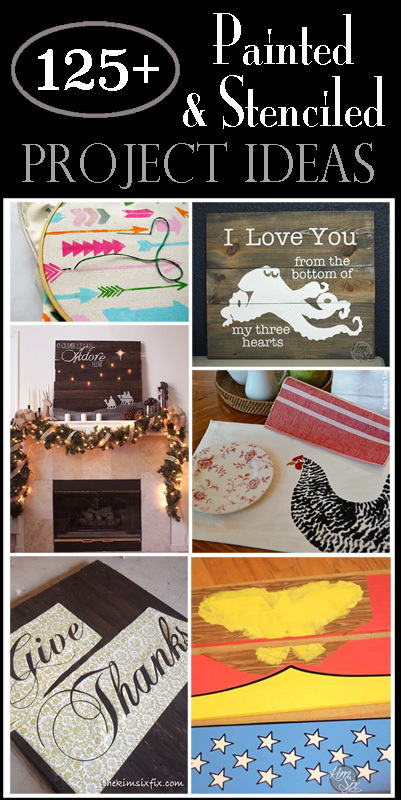 stenciled and painted projects. The best part about this collection is how it is a mix of all our personalities and interests. We all have a slightly different style.. form country and farmhouse, to whimsical and quirky. Plus these projects vary wildly when it comes to difficulty. There are projects that would take you 5 minutes, and huge projects that involve the entire room. I know you will enjoy browsing through them.. and will find something to be inspired by!